“Nagarjuna praised the Buddha, not only for attaining enlightenment, but also for teaching dependent origination. As the final homage at the end of ‘Fundamental Wisdom’ says the Buddha taught the holy Dharma to rid us of all distorted views. “Our intelligence is deluded by distorted views to uproot which the Buddha first taught the Four Noble Truths beginning with true sufferings and true origins. Detailed explanations of the Four Noble Truths include accounts of the Twelve Links of Dependent Origination. These are sometimes illustrated as the outer ring of the Wheel of Life that can often be found painted on temple verandas. It’s said that the original painting was commissioned by an Indian king. “Ignorance refers to our misconception of reality, which in his ‘400 Verses’ Aryadeva says permeates our disturbing emotions. 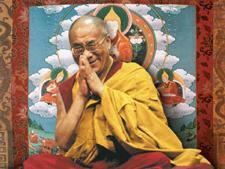 His Holiness remarked that everything appears as if it exists objectively and independently. He said that when he looks into the crowd before him he sees schoolchildren and Thai monks, who each look as if they exist from their own side. That is how they appear, but the Buddhist view is that that is not how they actually exist. His Holiness recalled mentioning yesterday that quantum physicists refer to nothing having objective existence. Today, he referred to an American psychiatrist, Aaron Beck, who has long experience of working with people deeply troubled by anger. Beck told him he had observed that when people are angry they see the object of their anger, usually someone else, in a wholly negative light, but 90% of this feeling is just mental projection. His Holiness considers this a valuable insight. His Holiness resumed reading Chapter Five of the ‘Guide to the Bodhisattva’s Way of Life’ from where he stopped yesterday. 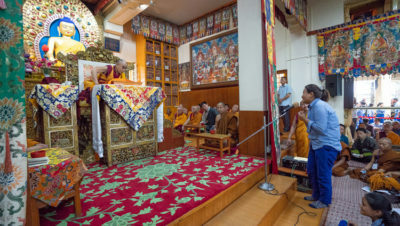 He touched on the qualities of a teacher, quoting Je Tsongkhapa, who said that one who will discipline others has to be disciplined themselves.